WHOA Expeditions is all about leaping out of our comfort zones as we explore new and uncharted adventure locations! We founded WHOAx to feed your need for more exploration, and to give you the chance to experience what it's like to be on our scouting team as we go off the beaten path and set the wheels in motion for future WHOA adventures. Join our tribe, be a pioneer, expect the unexpected and go on an expedition like only WHOA can! You'll get all the TLC and awesome group vibes that come standard on every one of our trips, but with an extra dose of spontaneity and excitement. Bring your curiosity, positive vibes and sense of adventure, and come take the trail less travelled with WHOA. Japan's deep reverence for nature and tradition can be felt in every aspect of life there. Its exquisite culture combined with its dramatic natural beauty give it a mystical allure that makes it a perfect addition to our WHOAx Expedition line up! The highlight of our journey is undoubtedly the Kumano Kodo pilgrimage trek through the sacred mountains of the Kii Peninsula. Over four days, we'll delve into Japan’s spiritual traditions as we hike to stunning shrines nestled amid cedar-covered slopes, following in the footsteps that emperors and kimono-clad worshippers have taken for more than a thousand years. 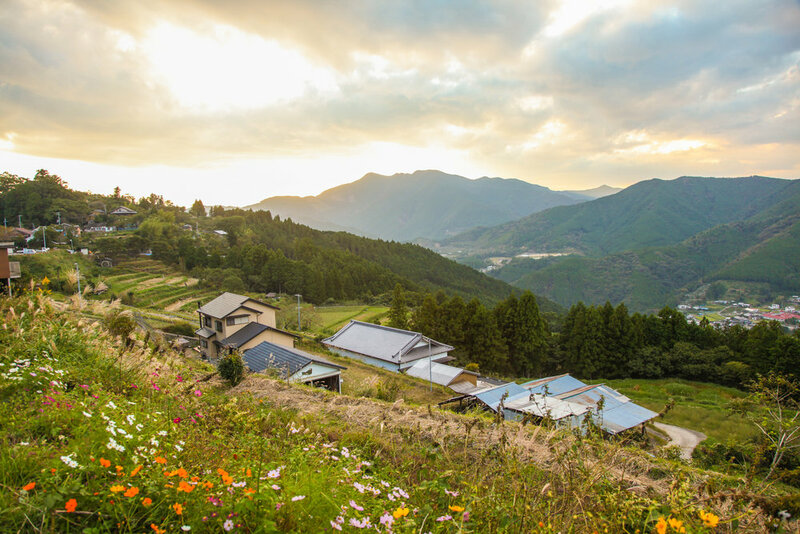 In the evenings, we'll sleep in traditional mountain inns and ryokans, dine on the freshest local ingredients, and enjoy the best way to end a day of great hiking – a natural hot spring bath! We'll bookend our trek with time in Tokyo and Kyoto, Japan’s current and former capitals, both of which offer more adventure and insight into the rich cultural heritage and buzzing modernity in the Land of the Rising Sun! *Putting down a $500 deposit will reserve your spot on this expedition (which is a good idea because it will fill up fast)! You'll be invoiced and must pay in full at least 3 months before the expedition start date. All deposits are non-refundable. Discount codes can not be applied to WHOAx Expeditions. YOUKOSO TO THE LAND OF THE RISING SUN! Plan to arrive at our hotel in central Tokyo by noon. In the evening, we’ll meet up with the entire group and our guide for our Welcome Dinner, where we'll enjoy an amazing authentic Japanese meal, and be briefed on the adventure that lies ahead! We'll spend today exploring both old and new Tokyo, taking in a variety of the sights and sounds of this buzzing city has to offer! We’ll start our day at Meiji Jingu, a magnificent Shinto shrine that was built in the early 20th century as a memorial to Emperor Meiji and his wife, Empress Shoken. Afterwards, you'll have free time to grab a bite and roam around the streets of the neighboring Harajuku and Omotesando districts – both of which are home to cutting edge fashion and contemporary architecture Tokyo is famous for! Later we'll take the subway to Asakusa and make our way down the historic Nakamise Dori shopping street to the Sensoji Temple. We'll have the evening free to continue discovering new corners of this city that never ceases to amaze! Today, we'll take the Shinkansen (aka bullet train) through Kyoto to Nara, the ancient city that preceded Kyoto as Japan’s capital from 710 to 784. 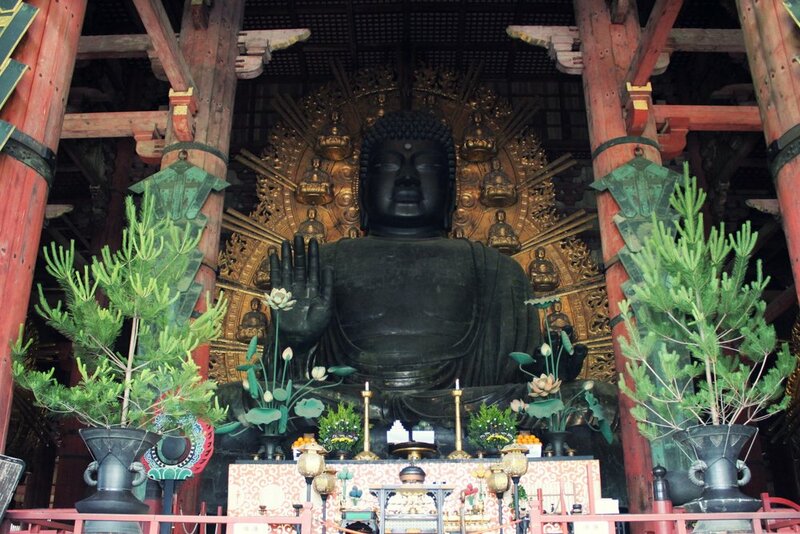 We'll visit Todai-ji temple, said to be the largest wooden structure in the world, and its iconic bronze statue of Buddha. In the afternoon, we'll have time to explore the scenic Nara Park and meet some of its sacred inhabitants, the free roaming Sika Deer, who are considered to be messengers of the Gods! HERE WE GO ON THE KUMANO KODO! Today our pilgrimage trek begins! We'll make our way to the start of the Nakahechi Route, which is part of the network of ancient trails on the mountainous Kii Peninsula known as the Kumano Ancient Trail, or Kumano Kodo. It has been a sacred site associated with nature worship since prehistoric times, and became popular in the 11th century as a place of pilgrimage from Kyoto by Emperors. Today's short hike will be to the small village of Takahara where we'll stay at a unique Japanese style lodge built by local craftsmen with spectacular views of the surrounding mountains. In the evening, we'll enjoy a sumptuous meal made with organic locally-sourced ingredients, and relax in their cypress wood hot spring baths! From Takahara, we’ll continue hiking along the Nakahechi pilgrimage trail. Along the way, we'll pass many small Jizo Bodhisattva statues, placed there by locals to protect travelers, as well as ancient tea houses (aka cha-ya) that provided rest to pilgrims right up until the early 20th century. We’ll descend to the village of Chikatsuyu, where we'll spend the evening enjoying more Japanese hospitality and our scenic home for the evening. Today the trail ascends to Tsugizakura-ōji, one of the many small shrines along the route where pilgrims often leave offerings. From there, we'll take a short bus ride, and continue hiking past ridge-top villages on our way to the first of the three Grand Shrines on the pilgrimage route, the Hongu Grand. The symbol of this shrine is a mythological three-legged raven, that represents the three Grand Shrines: Hongu, Hayatama and Nachi Grand. 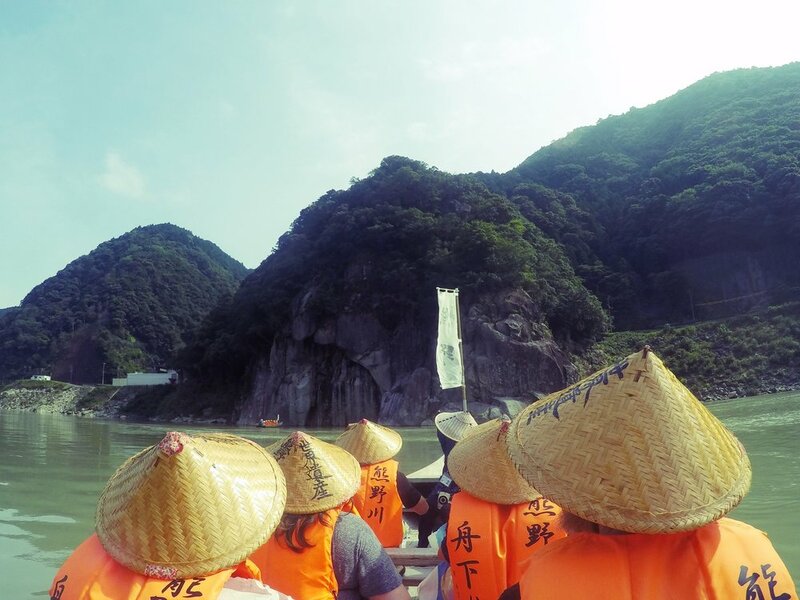 En route, we'll have the special opportunity to hike with a Yamabushi, or Shugendo priest, and learn firsthand about their faith and profound respect and connection with nature. Later in the afternoon, we'll head to our ryokan to enjoy a delicious Kaiseki style meal together. Today we'll trade in our hiking boots for life vests as we take a flat bottomed wooden boat ride on the Kumano-Gawa River. Our route will be the same that was used by pilgrims in medieval times to get from the Hongu to Hayatama Grand Shrine. We'll spend the afternoon exploring and learning more about the mythology of this significant Shinto shrine before returning to our inn for dinner. Today we'll see our final of the three Grand Shrines of Kumano - Nachi. We'll visit this impressive shrine and the nearby Nachi waterfall, which is said to be inhabited by the Kami spirit Kiryu Gongen. Afterwards, we’ll return to our lodge where we can enjoy one last soak in the hot springs and reflect on our epic pilgrimage before returning back to bustling city life! In the morning, we’ll take the train to Kyoto for the last stop on our journey! In the afternoon, we’ll explore the teahouses of the Gion district, where geiko and maiko (geisha and apprentice geisha) entertain guests with their musical dancing skills and artful conversation. The area itself is historic, and provides a taste of old Japan in the heart of the city’s modern downtown area. At night, we’ll gather to enjoy some more delicious Japanese cuisine together. Today will be a jam packed adventure, as we explore all the must-see sites of Kyoto. In the morning, we’ll visit the Nijo Castle, the former seat of the Tokugawa Shoguns in Kyoto. Next, we'll experience a Sado, or the ‘way of tea’ as it's known in Japanese. This exquisite cultural tradition began in the 10th century after tea was first imported into Japan and blended with Zen Buddhisim. Later, we'll continue on to the lively Nishiki market where you can explore the variety of culinary delights that Kyoto is famous for. You'll have free time to grab some lunch (you won't be able to resist) and explore the area. We’ll reconvene later in the evening for our special celebration dinner to toast the epic adventure we've all just shared! Our WHOAx Japan Expedition officially ends today, but that doesn't mean the adventure is over. For those of you that will be heading home, our local guide will be on hand to help purchase train tickets and provide detailed travel advice for going to Narita and Haneda Airports. Arigatou! We’ll be in touch ASAP. In the meantime, be sure to follow our adventures on Facebook and Instagram.